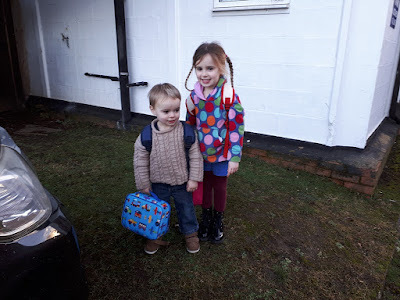 My little man has started going to nursery for a few half days (well nine until two). He's desperate to spend more time with other children, he's such a social animal! And this will give me a few valuable hours a week on my own that I can push on with the extension. All happy on his first day! He was so excited! Wouldn't even say goodbye! 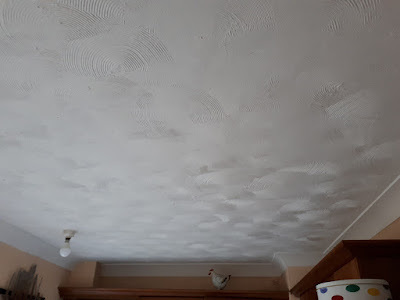 So the first day I spent running some errands and painting the doors in the extension as well as setting myself up for day two - The ceiling! I hate artex, but that's not the reason for this coming down. Unfortunately I need to remove it to run pipes and wires through to the extension so I can finish the bathroom before I knock through. I'd sent some samples off to be tested and they came back clear for asbestos so I knew I could do it all myself. 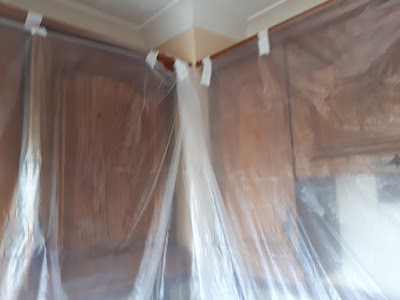 I removed loads of stuff from the kitchen (and had a good sort out at the time) and then sheeted everything up. I was against the clock from the start on this job. I knew I had to be finished and pick the kids up by two. I had a great plan of cutting between the joists and just pulling sections out with little mess. 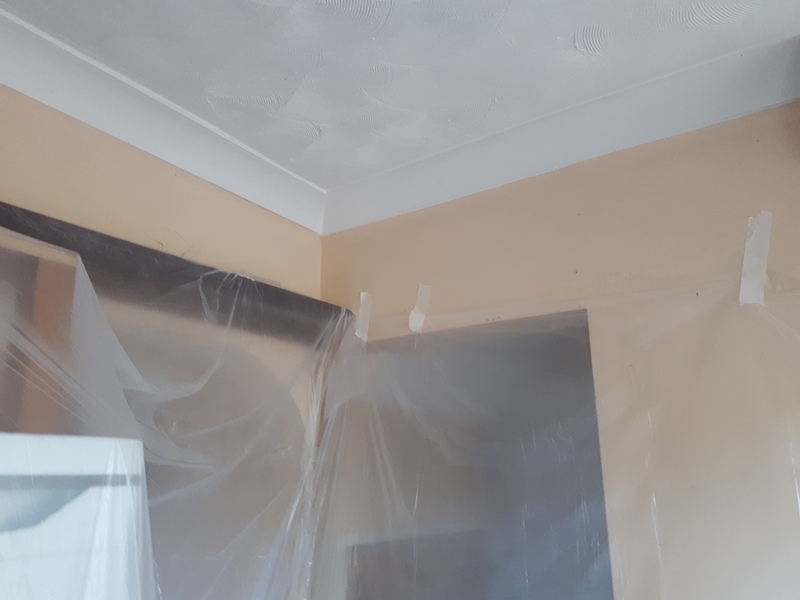 Unfortunately when I started someone had already added another layer of plasterboard to the ceiling and glued it to the first. This meant things were going to to get messy! I just had to rip it down and get on with it and hope I could clean it up before the kids came home. By the time two o'clock came I was ready to pick up the kids, but only just! 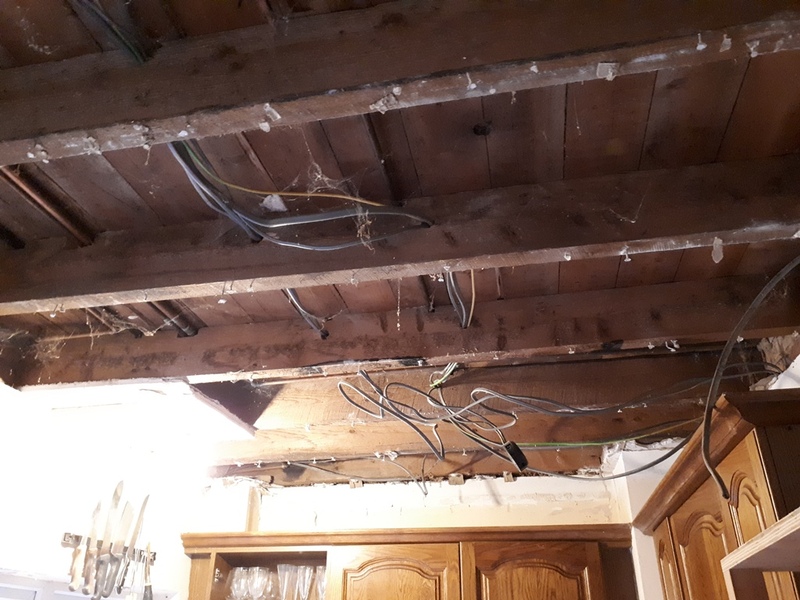 Two ceilings worth of rubbish and the previous trades men liked eating chocolate, leaving behind all their off cuts and not cleaning between the joists! There was a lot of rubbish up there and two washes to get it out of my hair! I cooked tea in there last night and it wasn't too bad, I need to get the hoover up into the hard to reach places and give it another good cleaning. I also keep finding bits I've missed, it's amazing how far it travels! Hopefully my electrician will come on Friday to get some lights upstairs in the extension. What's the most messy job you've ever done in your house whilst still living there? Like you removing ceilings, lovely job when finished, hubby did work himself, daughter and I spent the week in Spain visiting friends, the mess was horrible. 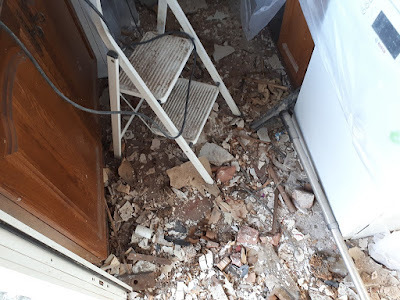 I think when I knock through and destroy the dinning room that I will probably send my wife and kids away for a few days, as well have to concrete the floors as well in there. It's going to be a right pain and the house will shrink for a fair bit of time. Can't wait until it's done. A walk in pantry and a big kitchen will make it all worth while! 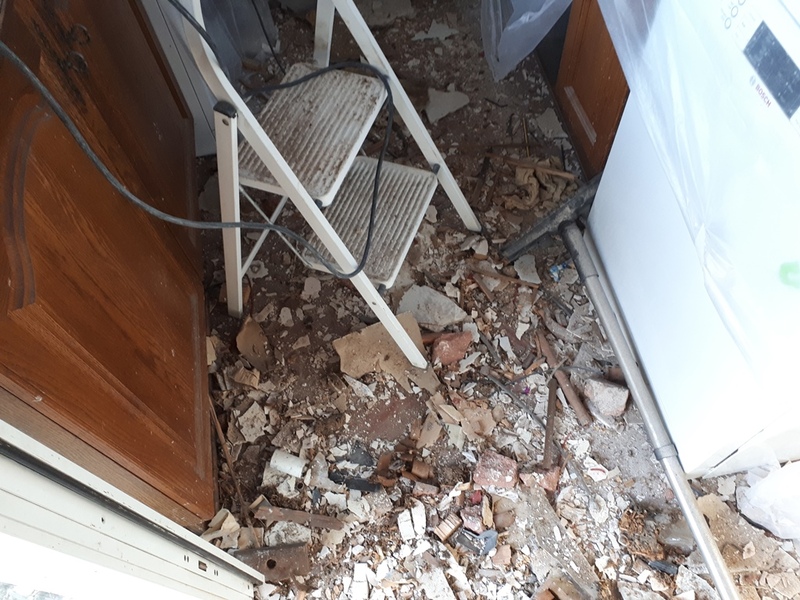 Window openings were made a bit too narrow and of course uneven, so we had no other option but to use raw power - fustrating, because walls of the extension were made by professional builders. One of the reasons we don't use professionals anymore. On the old part of the house we have to take down the ceilings, artex of course! 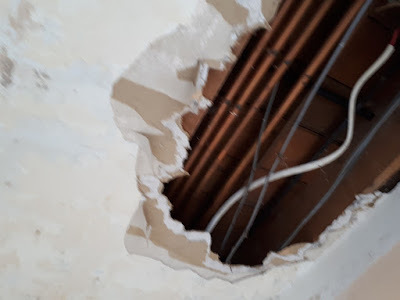 But there is also a ceiling heating (idiotic solution) elements and mice have been happily living inside insulation for the last 30 years. Our loft was insulated with hay, so hundreds of dead mice nests when we cleaned it out. Not a day I'd want to relive! Not all professional builders are bad! I'm One! Sorry Kev, I realised what I had written the moment I pressed publish... We had really good builders, and then a few that drove us to despair. None of them were "cowboy builders" but some were lacking some common sense. And I lied, we still use some proffs, who are more worth that their weight on gold (and yes, we pay them accordingly), but after 8 years of building I just don't want open the curtains in the morning to see someone using circular saw. oh he looks so cute! i had so much of this same mess with the redo at my daughter's house. they shoveled it out by the buckets full! Wow, what a job! Good idea to have the stuff tested for asbestos first. It seems like every job we do around our place is way too messy. Looking forward to the day we can get it all cleaned up! Your extension is going to be amazing when you get it done. One of our most recent messy jobs was taking off the conservatory roof and re-installing the specially designed 'sitting on steel pillars' new roof. It wasn't so much the off and on that was messy it was being open to the elements with just a plywood partition to the outside wild, wet and windy Welsh nights while it was being done. That's the downside to an open plan kitchen conservatory. But now it's done it has made such a difference to the house, I'll have to admit it WAS worth it. Looking forward to canning in the newly 'renovated' kitchen. Glad to know I'm not the only one with plasterboard falling in the food! I want to see the perfect home.